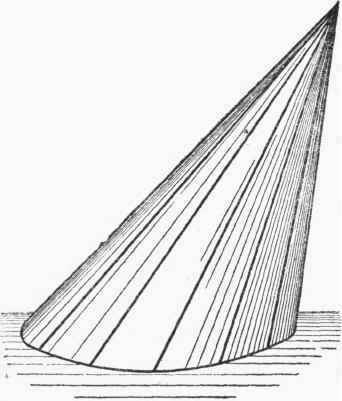 A cone of this description is one whose base is circular and whose axis is inclined to the base. Such a solid is shown in Fig. 140. Particular attention should be paid to the development of the surface of this kind of cone, as many articles can have their patterns readily set out for them when it is observed that they are formed from parts of the surfaces of oblique cones. In marking out the pattern for an oblique cone, the principle involved is to imagine the circumference of the base divided up into a number of equal arcs and the division points joined up to the apex of the cone, thus dividing its surface into a number of triangles. In Fig. 140 these lines are shown, the whole surface of the oblique cone being divided up into twelve triangles. 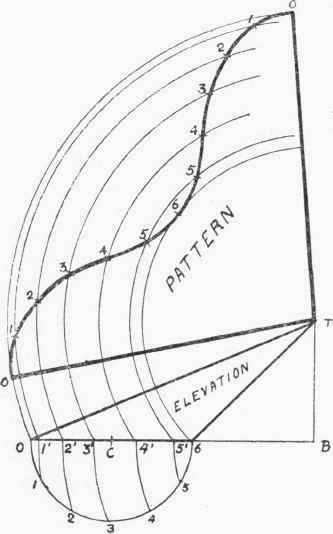 The setting out of the pattern for a complete cone is shown in Fig. 141. An elevation of the cone is drawn, and on its base a semicircle described and divided into six equal parts. The line T B is drawn perpendicular to the base line produced. Then with B as centre, and B 1, B 2, etc., respectively as radii, the numbered points arc swung round on to the base line as shown. Then using T as centre, and T 0, T ll, T 21, etc., as radii, arcs of circles for the pattern are drawn around. The compasses are now set to a distance equal to one of the six parts into which the base semicircle has been divided, and commencing at some point on the inner arc, say 0, the lengths are stepped from one arc to the other right up to 6, and then back over the arcs again to 0. If the points 0 0 are now joined up to T, and a fair curve drawn through the other points, the net pattern is complete. Allowances for the seam are shown by the dotted lines, the joint of same coming at the underside of the cone. 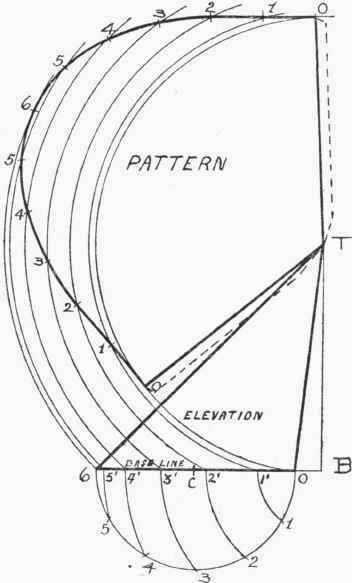 The pattern for a circular oblique cone which has a large amount of overhang is shown set out in Fig. 142. The distance that the top overhangs the centre of the bottom will be equal to C B, as in the last example. The height of the top above the base will, of course, equal B T. So that where these sizes are given, together with the diameter of base, the elevation of the cone will be drawn by first putting in the lines T B, B C, and then marking off the base 0 6. It will be observed that in this case the seam is arranged to come down the centre of the back of cone.